The summer will soon be upon us and yet again will start causing issues with the cooling of GPU and ASIC miners for a lot of people. 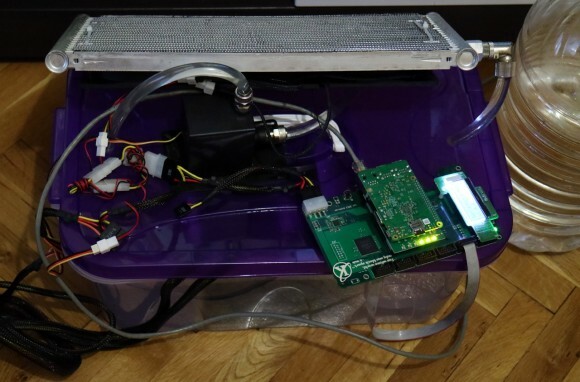 This is why we have started doing some experiments with cooling using mineral oil to submerge a miner and using a traditional water cooling hardware for achieving more efficient, silent and problem free cooling during the coming higher temperatures. Out initial experiments have started by using a single KNC Titan CUBE that is submerged in mineral oil, leaving the fan on the miner to move the liquid and using a water pump and a water cooling radiator with 3x 120mm fans attached to it. A simple setup with some water cooling hardware we have lying around unused, but enough to get us started in exploring the DIY mineral oil submerged cooling. Mineral oil is with different viscosity compared to water, so it is essentially a bit harder to move in a water cooling setup as compared to using water. Also submerging fans in it will make them move at a slower speed due to the increased resistance of the liquid as compared to air, some fans may even be unable to start when submerged in mineral oil. An example of such an issue with the fan not able to start rotating in the liquid is the 140mm Noctua NF-A14 iPPC-3000 PWM fans that are used as a common replacement for the stock KNC fans of the Titan ASIC miners. The biggest advantage of using mineral oil is that it is a dielectric and a good one at that, so it is safe to submerge electronics in it and when everything is surrounded with oil the heat gets easily moved from the components to the oil. When you move the oil through a cooling radiator with the help of a water pump you can keep it cool and thus get a lower operating temperature of hardware that is submerged in it. What you should be extra careful with is to keep the mineral oil clean, meaning that you need to clean up the hardware well before submerging it in. Introducing dust and other materials could cause potential issues with the liquid moving through the water pump and water radiator and even cause the cooling system to fail if it gets clogged. Another possible problem with other substances getting inside the mineral oil is that they might be conductive and since the oil is being moved around inside the container it is stored in with everything else inside it it may cause short circuit, though that is not very likely, it is still a possibility. Should you decide to takeout the submerged hardware from the mineral oil you will also need to clean it from the residual oil, you should be able to easily do it with alcohol or any cleaning fluid or spray you may have handy and the hardware will look like brand new after that. Our experiments with trying to cool a KNC Titan cube have shown some interesting results, but it also seems that ASIC miners like that with a single large crystal (or four under one hood) might not be doing that great as ASICs with many smaller chips. In fact we are not seeing much trouble with the ASIC chip itself when it is submerged, we are seeing weird behavior with the DC/DC power units. With normal air cooling the cube is working perfectly fine everything working at 325 MHz, but when submerged some of the eight DCDC power units start to behave weird and restart from time to time. Could be the thick thermal pads used that do not behave well when submerged in mineral oil, we need to do more research on what is causing the problem. 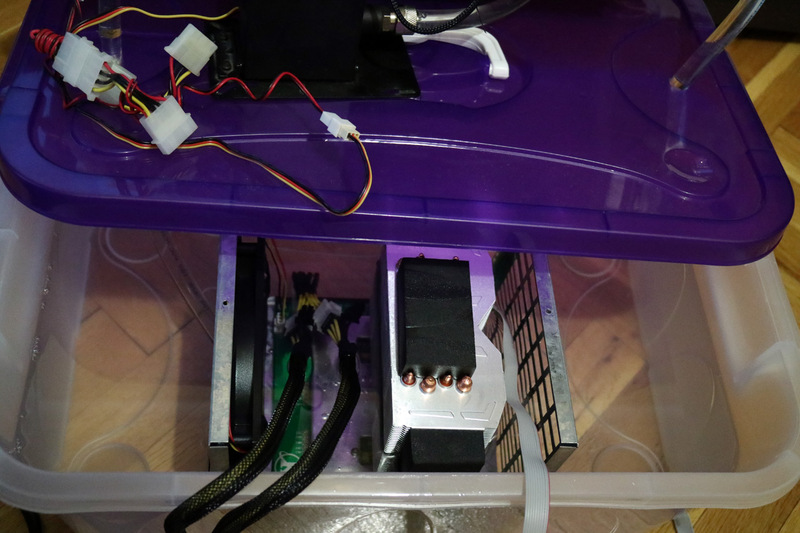 Bringing back the Titan cube to air cooling it is working just fine again, so for the moment we are going to move to doing tests with some other mining hardware such as the iBeLink X11 ASIC miner for example that might do better. As for cooling the Titan cube we are going to be looking for other alternatives besides the stock air cooling in the next days as we are not very happy with KNC’s approach.